Balancing Art and Technology, Aesthetics and Function, Harmony and Sustainability, Architect and Designer, Janus Welton, is a bridge linking the contradictions, simplifying the complexities, and shaping a new Design Sensibility for the 21st century. Janus brings over 12 years of Classical Feng Shui training and experience to her 20-year career in Art, Design, and Architecture. 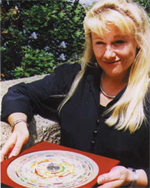 Traditionally schooled and credentialed, Janus has traveled the world to acquire and assimilate into her practice knowledge of the Art and Architecture of Ancient Cultures, the Vastu Shastra of India, and the Feng Shui of China. These influences can be seen in her work as a Senior Designer for Walt Disney Imagineering and as Director of Concept Architecture for Retail and Entertainment Centers for Sony Development, and in Los Angeles, where she designed award winning Residential and Resort developments. Janus has recently completed a 5 Star Oriental Spa in New York's Catskill Mountains and won a National Competition to design the Ram Dass Library at the Omega Institute in New York where she now resides and offers this wealth of talent, knowledge, and experience in private practice as Feng Shui & Ecology Consultant, and instructor for Eco-Arch DesignWorks and The New York School of Feng Shui.